Alex Raij, who co-owns with her husband and chef Eder Montero the Spanish restaurant La Vara (The Branch) in Brooklyn, in New York City. The couple serves dishes that come from Sephardic and Moorish traditions. NEW YORK, NY -- Jewish families coming together to celebrate Hanukkah will be surprised to find out that hidden inside their rich holiday meals—short ribs in red wine sauce, braised brisket with mushrooms, crispy potato latkes (pancakes) with apple sauce or sour cream, and deep-fried sufganiyot (doughnuts) filled with jelly—is a story about early Latinos. Sephardic Jews and Moors (Spanish Muslims) were expelled from Spain in 1492, but their heritage is embedded in the DNA of Spanish foods today. And this cultural connection would bring the descendants of those Jewish families in New York together with other Latino immigrants like Puerto Rican newspaper publisher Bernardo Vega in 1916. One of the most well-known Hanukkah dishes has a fascinating history. The potato pancakes known as latkes can be found fresh or frozen in many stores and delis at this time of year. Yet their origin can be traced as far back as the 13th century, and different versions of the pancake recipe connect foods from Europe, the Middle East and America. “I noticed that a lot of the things I related through my Jewish identity or even my interest in Middle Eastern foods spoke to me in each of the original cuisines of Spain," says NYC restaurateur Alex Raij, whose parents are Argentinian. For Eastern European Jews, the most popular latke recipes include grated potatoes. But even before the Spaniards imported potatoes from South America to Europe in the 16th century, Sephardic Jews (of Spanish or Portuguese descent) were making ricotta cheese pancakes in Italy. According to “The Encyclopedia of Jewish Food” by Gil Marks, these cheese pancakes became popular during Hanukkah because they combined two traditional types of Jewish foods—fried and dairy, making them the latke of choice until potato recipes caught on in the 19th century. Many Latino foods today share a common heritage with Jewish and Moorish cooking styles. Sofrito, for instance, a popular cooking base in Caribbean Spanish-speaking countries, sautés aromatic ingredients like chopped garlic, onion, peppers, tomatoes and cumin in olive oil. It was used by Sephardic Jews as a slow-cooking method for pieces of chicken, veal, beef or lamb. Other traditional dishes have Jewish and Spanish roots too, and these include deep-fried fritters known as bimuelos (or buñuelos in Spanish), ring-shaped cookies and cakes like biscocho (bizcocho in Spanish), deep-fried or baked half-moon shaped empanadas (pies) and even our beloved flan—baked custard with caramelized sugar. Over centuries, holiday foods have become a “glue” that hold many families together culturally, and this includes those of Jewish and Latino origins. Alex Raij is the daughter of Argentinean Jews who grew up in Minneapolis speaking Spanish with her family and eating cauliflower and spinach latkes with parmesan cheese and nutmeg. Her passion with food helps her reconnect with her origins. 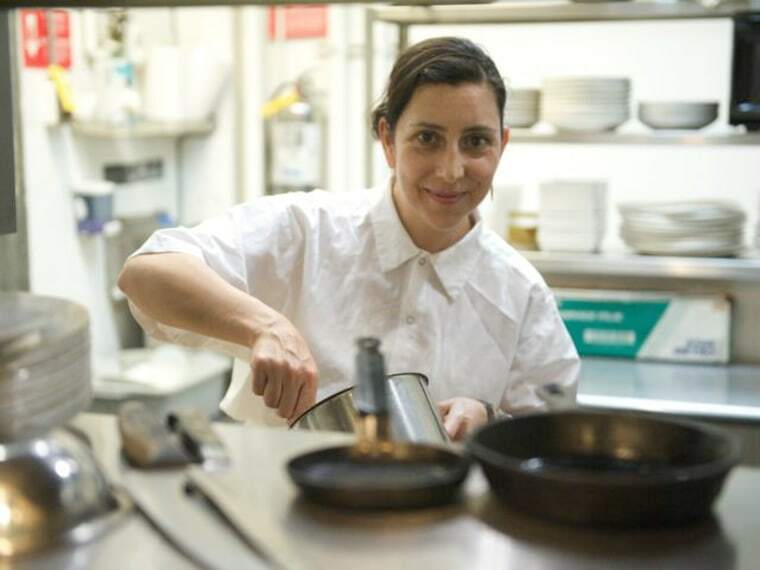 “I noticed that a lot of the things I related through my Jewish identity or even my interest in Middle Eastern foods spoke to me in each of the original cuisines of Spain,” said Raij, who co-owns with her husband and chef Eder Montero the Spanish restaurant La Vara (The Branch) in Brooklyn, New York. The couple serves dishes that come from Sephardic and Moorish traditions. Raij explained that food tells stories about the way people and cultures move. And La Vara’s menu is set up like a trip, where patrons can appreciate Spanish, Jewish and Moorish cultures through tapas and drinks from different regions in Spain. Top-selling dishes like fideuà, a Valencia-style noodle paella, can remind guests of Lebanese noodles or Moroccan couscous (a semolina dish), which are toasted to absorb flavor. The dish also contains savory shrimp, squid and clams in a mayonnaise-like aioli sauce that has seasonings familiar to Sephardic Jews. People look towards their family roots to discover more about their origins. Yet food can inspire us to climb up to the branches of our genealogical trees and see how they spread across continents and oceans to connect with others. It’s fitting that on Hanukkah, the eight-night holiday known for the miraculous lighting of its menorah (a candelabrum with nine branches), we reflect on how food has traveled, brought people together and preserved the legacy of their cultures. Arturo Conde is an editor at The Balance, a personal finance website. A bilingual freelance journalist, he writes for La Opinión A Coruña and has been published in Fusion, Univision and City Limits.